My female boss at work once gave me a YSL lipstick as a souvenir when she traveled abroad. It was an intense pink shade with a blue undertone on my dark skin tone. And with an intense fragrance. Not for me! Over 20 years have passed, and now I’m the same age as that female boss in the past. It has good reviews and the package was pretty, so I had it touched up at their counter, and bought no.13. Recently, my face get really dull after a while, and my tired face looks really terrible, so I wanted a color that will make my skin look brighter and my complexion more cheerful, and asked the staff to choose one for me, and ended up with this color. It's been around 20 years since I bought something as pink as this... It doesn’t smell as strong as it did back in the time, and it glides quite smoothly. I was a little hesitant at the shade at first when I bought it, but personally I feel like 1 application is enough over Dior’s Lip Maximizer. Unfortunately it isn’t long-wearing, so I give it 4 stars. I wanted to carry less item in my pouch, and I liked how this product required no lip gloss, so I checked out a few shades at their counter and bought 09. It’s a muted pink that seems versatile to use in any season. I do like how this gives sheerness and beautiful glitter when applied twice after a lip balm. I personally don’t expect lipsticks to wear long (I wouldn’t want a lipstick that won’t wear off even if you eat... it seems so irritating), so that wasn’t a turnoff for me. I deducted 1 star because of its high price... After applying a lipstick my lips always get dry, but this doesn’t make them dry, so that’s really good. It also looks gorgeous and makes me feel happy. It smells of mango slightly when you take off the cap, and it doesn’t smell when you’re wearing it. It isn’t for you if you want your lipsticks to wear longer. I can completely recommend it, since I really like the natural makeup look. My skin color is yellow-base, with a fair complexion, and my lips don't have much color. I have color #43. At the store, I thought it might be a little too flashy, but when I tried it on, it looked really nice and natural, and my complexion looked brighter overall. It totally goes with the natural look. It's like, it's really not too bright or vivid, it makes my skin look brighter, everything I want. 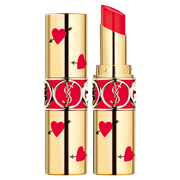 You don't need to put it on in a special way, although it's a little better with the YSL lip primer. I think the color lasts long enough. It comes off a bit when you eat, but through normal wear it'll get you into the evening. I've never been a lipstick wearer, but when I found this one, I realized I couldn't do without it. I've got #15, 49, and 51. #15 Corail Intuitive It goes without saying that this is a princess fantasy lip color. It seemed like a safe color, so I bought it. This pink coral color would probably go with anyone. It's a bit sheer, but it's just about right. It's the one I use the most. # 49 Rose Saint Germain A deep cherry pink. It's got a little blue tint. It looks a bit like a bright fluorescent pink, but when I put it on I was surprised at how translucent it was. But if you apply too much, it's a bit overpowering. # 51 Rose Saharienne This is super cute. It's a bluish milky pink. I was a good purchase because this kind of blue-tinted milky pink doesn't look like many other brands. I think it might look good on light-skinned people? I bought 51 first, and it felt so lovely that I bought more. It's glossy, and doesn't irritate me lips...it's the best.